Rutie, What an eye you have .I love this.Did you keep them? That’s so pretty! The pop of yellow and the twist of purple stand out to me!! Do they even make it anymore…so old fashioned. 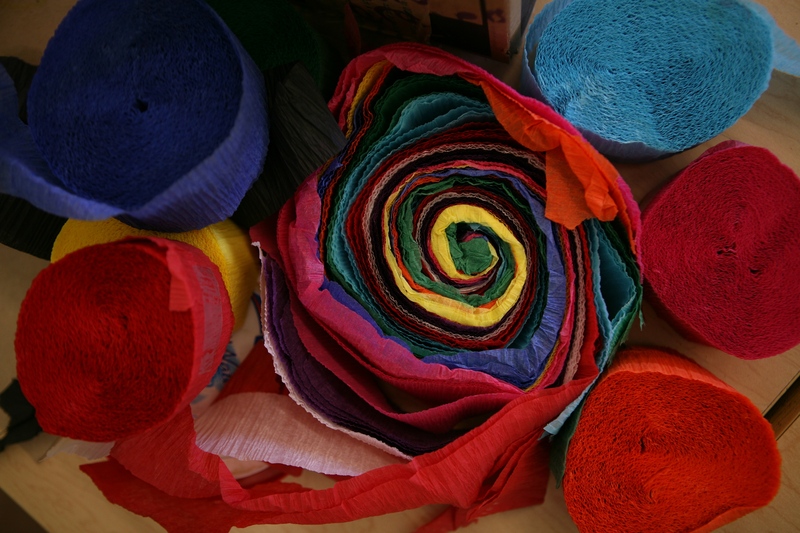 Altho Crepe paper did not always make me happy ….everything OK through twisting, taping ….. then the drooping!I thought it was only my crepe paper that drooped because I did not put it up correctly! Your spiral idea reminded me of a labyrinth, different paths to the center and out, but I remember in former Summers East Liberty Presby. Church has placed their Chartres-path Labyrinth in their outside space (cloister? )2x a week, open to all. Think I go see if I can “take a hike” / walk the labyrinth summer of 2010!! !